A Second Letter to the Geological Society | Watts Up With That? In June of this year, Howard Dewhirst, a fellow of The Geological Society (London), wrote a letter to the President of the Society voicing the concern of 33 current and former fellows of the society, as well as other concerned geoscientists, that the Society’s position on climate change is outdated and one-sided. As of this writing, receipt of the letter has been acknowledged, but no reply has been received. Given the long period of time, Howard has sent a second letter to the Society, it is reproduced below. We understand that the council is reviewing the The Geological Society’s 2010 and 2013 position papers on climate change which was the subject of the letter we wrote to the society in early June. We also understand that despite the clear interest amongst Fellows – and other scientists, that the society will not be publishing further letters until the new position paper has been agreed. If true, we (the contributors to the first letter) think this is unfortunate, as now would be the very time to solicit informed opinion from Fellows and others as there clearly is not a consensus. This is a new field of scientific endeavor as there were very few graduates in ‘climate science’ as little as 10-15 years ago, meteorologists, astrophysicists, geologists, yes and many others with some knowledge of what is a very wide field, to some of whom your current committee will doubtless listen. That there are so many aspects of this exceedingly important debate which have yet to be raised let alone evaluated, it seems strange for the Society to close down that debate, as if everything that needs to be looked at is well known and agreed. This concern informed some of the thinking behind the open letter and which I will be reviewing at a Climate Change Conference in Portugal in early September. The conference is very difficult to find on Google for some reason, so I have attached a link, https://www.portoconference2018.org) and a copy of the revised abstract of my talk, where you will find a dozen questions, or areas of uncertainty that we believe warrant closer examination. Your committee may already have done this and if so, we look forward to reading their conclusions. We were sure that the Society would update the 2013 addendum as much new data has been made available since then, but we are concerned that as presented, the two papers gave the impression that they were supported by the majority of Fellows. While there are only 41 Fellows names on our letter to date, most have many colleagues who think that some modification of the papers could make them more representative, and of course there are the attendees of the Porto Conference. Sadly, many of those who do support AGW theory have chosen not present or even to attend, missing a wonderful opportunity to demonstrate their arguments and win converts. The ideas of just a few, mainly academic committee members, however well meaning, is never going to reflect what the Society of Fellows thinks as a whole. This is not a plea for the Committee to swallow our version of the evidence, but to acknowledge that it exists, that it is not just an ill-informed fringe opinion and can’t be swept under the table. The link to the conference enables you to download the very large pdf of abstracts and supporting material which you will see cover a much wider range of technical concerns than our letter, and are presented by more widely acknowledged and qualified, peer reviewed scientists, which I for one am not. I would however be more than happy to present the paper to the committee as it is very important to us that you are aware of our motivations and intentions. Unfortunately, many of the authors have been described as denialists by those who support the IPCC mantra and so their observations and data tend to be dismissed without examination – on the mistaken assumption that anything a ‘denialist’ says has to be wrong. This is difficult to grasp as the ethics of the geological industry in which I have worked are driven by examination of all the data, good and bad, for if we did not and got it wrong, we would not last long; as even Einstein didn’t get it all right. Data is the key, when one side says for example, Arctic ice is melting and the other says, yes but Antarctic ice is not melting,’ this should in theory be resolvable, sadly it is often not, and confirmation bias strikes as one side or the other, or both, resort to labelling each other, rather than examining the data dispassionately. One simple illustration should make clear our concerns, we noticed that the two papers were both composed during the current ‘pause’ in global warming, but do not mention it; if it is real it should form part of the story, if it is not, then that needs to be demonstrated, and not swept under the carpet. We also find that the papers although focused on the geological record, are strongly biased by uncritical acceptance of the IPCC’s AGW theory, hence we are concerned to preserve the Society’s strong tradition of examining all sides of an issue. You are doubtless aware of the publication of the two position papers on the Energy Matters blog site (http://euanmearns.com/the-geological-society-of-londons-statement-on-climate-change/) and of the huge interest this stirred in the greater geological community. This was never going to be a venue for decision making, but we believe it served a very useful purpose which we would like to see continued by the simple expedient of the Society inviting a wider range of correspondence and publishing it on the web site, as if it were a blog; obviously only a couple of letters can ever be published in the magazine. In the past it used to be that only peer reviewed papers were considered as valid statements of fact, many peer reviewed articles have of late shown that ‘peer reviewed’ has somehow lost its way – and not just in the field of climate change. And blog posting is increasingly accepted as the critical comments always accompany the posts, unlike peer reviewing, where the ‘who and what’ discussions are usually invisible – as was made clear in the Climategate saga. Finally, we thank the Society for its openness and its tradition of scientific impartiality; we do not think that we alone have the answer as there is much uncertainty in the data, but neither should the Society when so much is at stake. August 29, 2018 in Climate News. maybe its time to start a second geological society. People could join both. The same would be an approach to the NSPE, AIChE and ACS. It’s time to start a second medical board, medical schools etc. I sorely miss the word “Royal” in the name of the society. Its absence apparently encourages undisciplined, individualistic thinking. Well, eventually Charles will be on my money, so…maybe not. Why would a new letter have to be made over a scientific institution’s stance over something that isn’t their study, their interest, their responsibility and that also doesn’t exist? Before a mess of computer programmers co-opted the name “climate scientist,” climate was studied mostly by geoscientists. I still maintain that there is no such animal as a “Climate Scientist”. There are scientists who study various aspects of climate, however, with over 80 subjects going into the study of Earth’s climate, assuming one first 4 year degree, followed by 6 months study of the remaining 80 subjects, a true “Climate Scientist” would start their career aged around 60 years old, close to retirement! A close relative of the Norwegian Blue parrot. Would that be the same Norwegian Blue, that was attempted to be returned to an Ipswich pet shop? Yes, the one pining for the fjords. pinin’ for the fjords? what kind of talk is that? It’s not pinin’, it’s passed on. This parrot is no more. It has ceased to be. It’s expired and gone to meet its maker. This is a late parrot. It’s a stiff, bereft of life, it rests in peace. If you hadn’t nailed it to the perch, it would be pushin’ up the daisies. It’s drawn down the curtain and joined the choir invisible. This, is an ex-parrot. Is that the one you mean? Would you be interested in replacing it with a slug……? Careful, you might say that about oceanographers. Fortunately, the field started before the new dark ages, but still! Timothy Ball received a PhD in Climatology in 1984. I believe he is/was one of the few real climate scientists and of course is a distinguished sceptic. He was the one who first exposed me to all the uncertainties. I once speculated that a group of people could take over all the NGOs in our city. They would buy memberships in each NGO, vote each other onto the boards, and hire each other onto the paying positions available. I wonder if something like my old speculation is going on with the AGU. Are people joining just so they can influence the AGU’s political position on CAGW? It seems reasonable that someone who has joined an organization for a particular purpose wouldn’t care about the more general concerns of the organization, and wouldn’t bother to attend meetings, etc. merely asserting that global warming is important does not make it so. in fact, without specifying the context within which to evaluate it, it can not be evaluated. that makes it unreasonable on the face. it is not important to me for anything. Must say that I even battled to read this post as all links via the e-mail now have to go via ‘safelinks’ and they are subsequently thrown out as WUWT is apparently not considered a ‘safe’ site. They ask me to check this with WUWT? There is no man made warming. Or it is so small that man cannot even measure it? Click on my name to read my final report on this. I agree with Scottish Sceptic – I had no problems with any of the links. It appears that the “safelink” issue may be unique to your browser / security software / ISP. My internet protection does not rate WUWT as not “safe”. But thanks for the post. I logged on to your site through your name as suggested and found your report interesting, enlightening and believable. I agree that we’re due for a cooling cycle, but feel that the secular warming trend (the Modern Warm Period) should remain in place for at least a few more centuries. 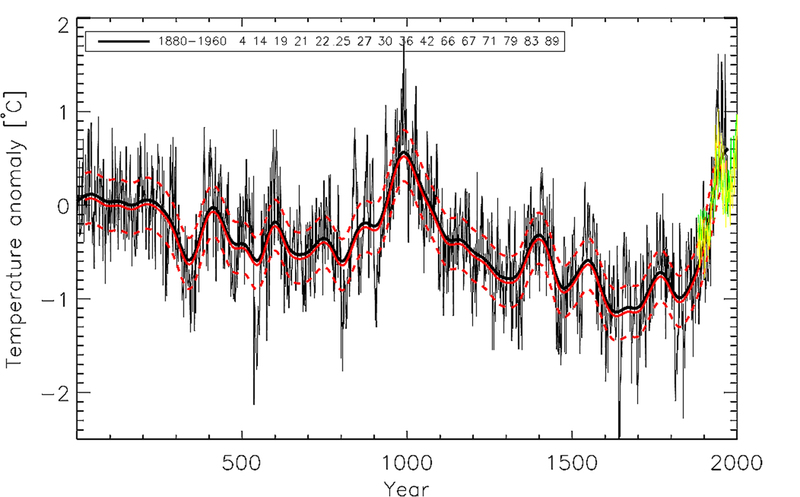 The Minoan, Roman and Medieval Warm Periods lasted hundreds of years, not just ~150. 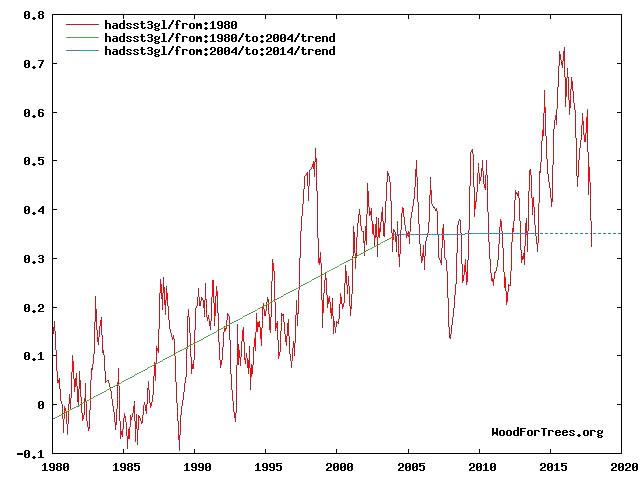 The hadsst3 data shows global SST temperatures are now below the pre El Nino trend. It’s like the Dark Side and the Force battling each other in a science fiction movie. There is no dark side of the force, really. Matter of fact, it’s all dark. … Oh, that’s the moon, sorry. Oh, a Kathleen Kennedy fan. Blech. Ah, but under the carpet it shall be swept, nonetheless!!!! Howard Dewhirst is the epitome of a balanced scientist. And balanced science will always win through in the end. In a chaotic system like the world’s climate, by definition there can be no black and white. Data is the key, as he says. We “deniers” are probably too impatient : we expect instant recognition. But life isn’t like that. Truth will show in the end – and chances are that our present viewpoints will need moderation also. Returning to the matter of scientific organizations, we find a variety of patterns of influence. The most obvious to recognize (though frequently kept from public view), consists in prominent individuals within the environmental movement simultaneously holding and using influential positions within the scientific organization. Thus, John Firor long served as administrative director of the National Center for Atmospheric Research in Boulder, Colorado. This position was purely administrative, and Firor did not claim any scientific credentials in the atmospheric sciences at the time I was on the staff of NCAR. However, I noticed that beginning in the 1980’s, Firor was frequently speaking on the dangers of global warming as an expert from NCAR. When Firor died last November, his obituary noted that he had also been Board Chairman at Environmental Defense– a major environmental advocacy group – from 1975-1980. One could go on at some length with such examples, but a more common form of infiltration consists in simply getting a couple of seats on the council of an organization (or on the advisory panels of government agencies). This is sufficient to veto any statements or decisions that they are opposed to. Eventually, this enables the production of statements supporting their position – if only as a quid pro quo for permitting other business to get done. Sometimes, as in the production of the 1993 report of the NAS, Policy Implications of Global Warming, the environmental activists, having largely gotten their way in the preparation of the report where they were strongly represented as ‘stake holders,’ decided, nonetheless, to issue a minority statement suggesting that the NAS report had not gone ‘far enough.’ The influence of the environmental movement has effectively made support for global warming, not only a core element of political correctness, but also a requirement for the numerous prizes and awards given to scientists. That said, when it comes to professional societies, there is often no need at all for overt infiltration since issues like global warming have become a part of both political correctness and (in the US) partisan politics, and there will usually be council members who are committed in this manner. “The [Porto] conference is very difficult to find on Google for some reason, …” What a surprise. Any geologist worth a schist knows that CO2 is a bit player in the temperature of the troposphere. Moral and intellectual cowardice with respect to honesty about AGW is the default response of the scientific societies and journal editors. They do not have the courage of their purported convictions. It would be a courteous answer of the Society to inform the Porto Organisation that they will be pleased to attend the 2018 Conference. This would be a nice opening for a continuing discussion. Yes, it would be courteous. The problem would be persuading the Geological Society’s 12,500 members that less than 50 members should be shown such a consideration. WR: Or should not be of any importance. In respect to Einstein’s quote: 50 members is quite a bit. The conference IS very hard to find on Google. It may be swamped by the Porto CCC that was in July. The first successful search result I got was (yay) the WUWT article by Monckton from last month. I always use DuckDuckGo nowadays. Is there ANY evidence that less than 90% of the Fellows accept the scientific basis for AGW? Alternatively, is there any evidence that more than 10% of the Fellows support the scientific basis for AGW? Every professional organisation should be challenged to turn on another one that said some pretty dumb thing. Or claim that none said one dumb thing. We need to make a rule that proper behavior for professionals is Trump like not UK lords like. If you don’t regularly accuse others of being buffoons, you are probably one. Totally reasonable. And therefore this will be ignored. Just to refresh readers mind about the current position of the Geological Society of Australia (GSA) which was revised after very strong protests from members about the Executive Committee’s previously stated pro-AGW stance. As published in THE AUSTRALIAN national newspaper (paywalled so I copied and pasted below). AUSTRALIA’S peak body of earth scientists has declared itself unable to publish a position statement on climate change due to the deep divisions within its membership on the issue. After more than five years of debate and two false starts, Geological Society of Australia president Laurie Hutton said a statement on climate change was too difficult to achieve. The backdown, published in the GSA quarterly newsletter, is the culmination of two rejected position statements and years of furious correspondence among members. Some members believe the failure to make a strong statement on climate change is an embarrassment that puts Australian earth scientists at odds with their international peers. It undermines the often cited stance that there is near unanimity among climate scientists on the issue. GSA represents more than 2000 Australian earth scientists from academe, industry, government and research organisations. A position statement published in 2009 said the society was concerned about the potentially harmful effects of carbon dioxide emissions and favoured “strong action to substantially reduce current levels’’. “Of particular concern are the well-documented loading of carbon dioxide to the atmosphere, which has been linked unequivocally to burning of fossil fuels, and the corresponding increase in average global temperature,’’ it said. Publication of the position statement caused an uproar among members and led to a revised statement, after wide consultation. The revised statement said: “Geological evidence clearly demonstrates that Earth’s climate system is inherently and naturally variable over timescales from decades to millions of years. “Regardless of whether climate change is from natural or anthropogenic causes, or a combination of both, human societies would benefit from knowing what to expect in the future and to plan how best to respond. The revised statement was criticised as being too vague. “As evidenced by recent letters to the editor … society members have diverse opinions on the human impact on climate change. However, diversity of opinion can also be divisive, especially when such views are strongly held. “The executive committee has therefore concluded that a climate change position statement has the potential to be far too divisive and would not serve the best interests of the society as a whole,” the statement says.